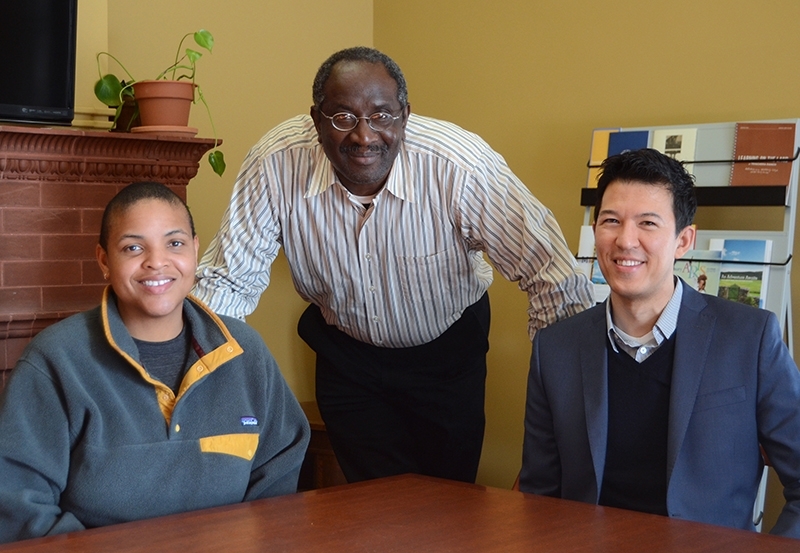 From left: J Finley, Nathaniel Nesmith, and Alvin Henry are C3 post-doctoral fellows at Middlebury. MIDDLEBURY, Vt. -- Recently three faculty members – J Finley (American Studies), Nathaniel Nesmith (Theatre), and Alvin Henry (English and American Literatures) – came to the Communications Office in Kitchel House to discuss their impressions of Middlebury after teaching their first semester at the College. All three have new two-year post-doctoral fellowships offered by the College in conjunction with C3. Funded by the Andrew W. Mellon Foundation, C3 – Creating Connections Consortium – is a partnership among several colleges and universities with the goal of diversifying faculty in higher education and allowing students and faculty from all backgrounds to advance along the academic pathway. To follow is a condensed version of the first half of the conversation. The second is available here. What attracted you to the C3 program? J: What attracted me was the prospect of teaching at a liberal arts college because I went to a small liberal arts college for undergrad and so that was an experience that I really – not just enjoyed, but got a lot out of it in terms of my development as a teacher and scholar. Alvin: I came to C3 because, like J, we both went to Berkeley and we were teaching larger classes. And so coming to C3 enabled us to work closely with students. It built mentoring relationships working with them on senior theses that weren’t really possible at Berkeley. So to get these relationships for me was fun because, unlike J, I went to large state schools all my life. Also the diversity aspect of working with students of color, working with first generation students was really an exciting prospect because we both turned down other post docs for this one because at least for me there was no opportunity to mentor students of color and I really wanted that aspect. Nathaniel: I had already taught at a few different places. Most of the schools have been in Manhattan, and I also taught at the University of Pennsylvania. So I wanted to have the opportunity to teach at a smaller college [where] you have smaller groups of students that you could mentor and advise. That was very important to me because I’d done some mentoring and I found it very fulfilling – not just the teaching, but also having an opportunity to share with the students what you’ve done and what’s important to you. After teaching one course at a small liberal arts college, what do you think are the main differences between this and teaching at a large university? Nathaniel: It was interesting to me to come to Middlebury and probably have the most diverse class I’ve ever had. That really surprised me. And the students sort of felt the same way because I had international students and African Americans, Latinos and so forth. Given that Vermont is one of the whitest states in the Union, I didn’t expect to encounter that, and I’m quite sure it doesn’t happen across the board. But it was just reassuring to have that group of students. That was important to me. J: The difference between students at a larger university versus a Middlebury, say, I think that their expectations in the classroom are different. I think the kinds of things they think about, the kinds of questions they ask are a little bit more critical. Alvin: I think the big difference for me was, just as J was talking about, the students really challenging you to challenge them – they didn’t want a traditional English class. [Another difference is] developing the relationships with students – so at Berkeley I stay in contact with maybe three or four students after teaching there for six years. But here, like all of my students still email me after the semester is over. I’m working with three of them for summer research projects already. So that’s been one of the big differences. And also being asked to do fiction workshops. I’m not a creative writer, but students of color really wanted someone to bounce ideas off of and give feedback. The whole experience of engaging with them and knowing them and their first names and where they came from and what they’re interested in and where they’re going, and brainstorming their graduate programs and their jobs in the future. It’s really rewarding and I didn’t expect any of that to happen. How have other Middlebury faculty responded to you teaching here? Nathaniel: The faculty has been very welcoming. I’ve just been very, very happy with them. Alvin: They’ve been very welcoming and encouraging. So for example, J and I were both participating in the CCSRE (Center for the Comparative Study of Race and Ethnicity) and the Gender, Sexuality, and Feminist Studies Advisory Groups. So the faculty there have really put us in leadership roles and invited us to participate in these organizations from the very start. And I also participated in the disability studies working group and we meet monthly and talk about our research. They were generous enough to workshop one of my articles that I just submitted to a journal. J: I didn’t get that lesson. What do you think you bring to the Middlebury Community? Nathaniel: I’m an older candidate who started out as a freelance writer and then got a master’s in criminal justice, which was actually my first career. I also worked at a lot of different theaters, being a dramaturg and literary manager. So I sort of feel as if I bring a great deal that I can sort of share with the students here, not just my involvement with theater but also as someone who did some playwriting. I have a sense of what it’s like when people are submitting plays because I’ve sat behind a desk enough reading those plays and rejecting so many of them. And the mere fact that I spent so many years working as a freelance journalist, that’s also something that students have an interest in trying to do. I’m just going to introduce students to contemporary playwrights, particularly African American playwrights. A lot of these people I just know, but a lot of that has to do with the fact that I’ve just been at it for a long time. So when I had my class and we Skyped with [playwright] Dominic Morriseau, the students found it sort of very engaging and I was like, this is just part of my life. This is what I do. J: What am I bringing to the community? If you bring a certain kind of passion to the teaching then I think students pick up on that and they learn in a different way. They learn more. I feel like I try to always sneak in a good history lesson in my class. If you don’t get a history lesson out of one of my classes then I didn’t do it right. I like the sense of leaving the class really knowing that you really open students’ minds to really think about the world and think about culture in new and different ways. So I think that any time you can bring curricula that focuses on people of color, I think that is something that is really necessary and important and something that I’m really, really happy to be doing. Alvin: I would just second what J was talking about. [During spring] semester I’m teaching multiethnic American literature just so the students can be like, where am I in the curriculum? How am I represented in this curriculum? And so we bring, in large part, together as a cohort, that answer. We’re showing them their history and the best part is a lot of the students who aren’t part of those minority groups are really fascinated because they want to learn about it also. And other things we bring are, I’m a first-generation college student and at Middlebury there are a large number of people like me, so it’s nice to be able to also be a resource for those students and to represent on the faculty not everyone is from a privileged background. You can do this too. We love teaching and this is probably one of the best places to do that. J: That’s the thing I’ve heard, too. I’ve heard that about all three of our classes, that people really have been hungry for these kinds of classes. The students have really wanted the kinds of classes that we’re teaching and that’s really sort of edifying to hear faculty and students really affirm what it is that we’re doing here. Thank you for your work and for your openhearted responses to students' energy and interests. In my own classes, I have had students speak very warmly about what they have learned from your teaching. Your presence here is an essential part of who Middlebury needs to be/become. Thank you.